I am going to make a broad statement here as a full-blooded Ukrainian Girl: The average non-Ukrainian, non-Polish person that lives in the Durham Region is absolutely and unequivocally in LOVE with fresh perogies. Every single day, the last week of June (every year since 1961), thousands and thousands of Oshawa residents line up at the Ukrainian or Polish Fiesta Week pavilions to devour thousands and thousands of those plump little dumplings that glisten with newly melted butter and (in some cases) sautéed with tiny little pieces of onion heaven. Being heavily involved with Lviv Hall during Fiesta Week for my entire life, I’ve seen some people wait over two hours for the ladies in the kitchen to make more perogies after they’ve run out. Did you know you have several options for buying fresh perogies in Oshawa ALL YEAR LONG??? Not many people do. I’m here today to share two glorious secrets to obtaining the freshest, tastiest Ukrainian/Polish food in the Durham Region. Firstly, if you’re looking for Ukrainian Take-Out, all my surrogate Aunts would be happy to serve you at Lviv Hall on Tuesdays. To be completely honest, I can’t really give you an un-biased review of the food here because I’ve eaten Lviv Hall perogies (or Perohy as they’re called in Ukrainian), my entire life and I am fiercely loyal to the ladies who gather downstairs at the hall and create those incredible little potato masterpieces. They are the best in town, in my humble opinion. Lviv is located just off of Simcoe St South, north of the 401. In fact, our architecturally eye-popping church can be seen from the highway like a giant, beautiful reminder to never misplace that Catholic Guilt that sits on your shoulder most of the time. Oh wait…is that just me??? Sorry. 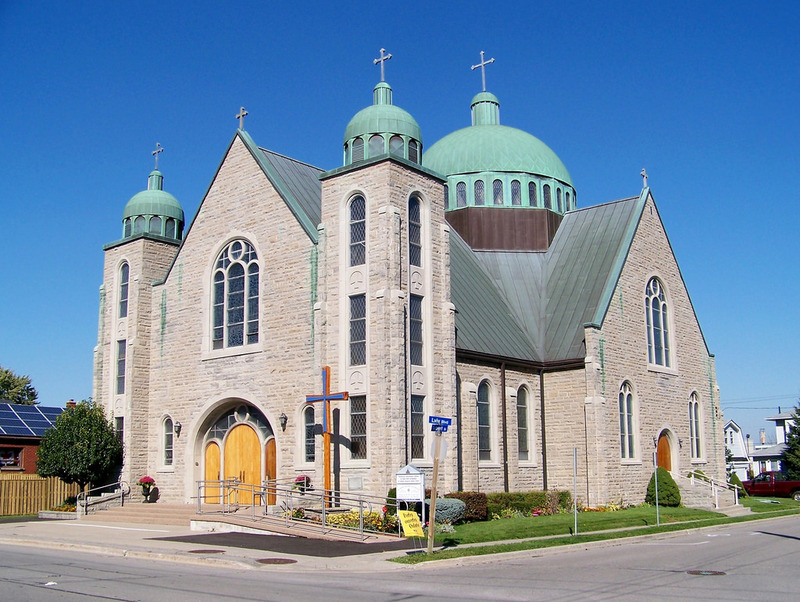 Anyway, my parents were members of the church since they came to Canada in the 1940’s. 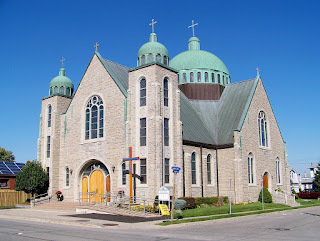 In fact, my Dido (grandpa) Johann, physically helped build the church in the 1950s. My parents were married there. My brother and I were married there. All of our kids were baptized there. We’ve attended funerals, first communions and holy holidays there. It’s been a comforting constant in our lives forever. Sometimes sad, sometimes happy. Like the video for Guns n’ Roses’ ‘November Rain’. I never understood why Stephanie Seymore’s face was split up by that piece of mirror at the end, though. Odd directorial choice, in my opinion. I love our Ukrainian community in Oshawa. I recently suffered the loss of both my parents and my brother in a very short period of time. The way that the entire Ukrainian Community rallied around me during that time was mind-blowing. Whoever said it takes a village to raise a child, was spot on. So as far as I’m concerned, the perohy sold at St. George’s Ukrainian Catholic Heritage Centre (LVIV HALL) are the BEST IN THE WORLD. Lviv Hall is open for Take-Out every Tuesday throughout the year. 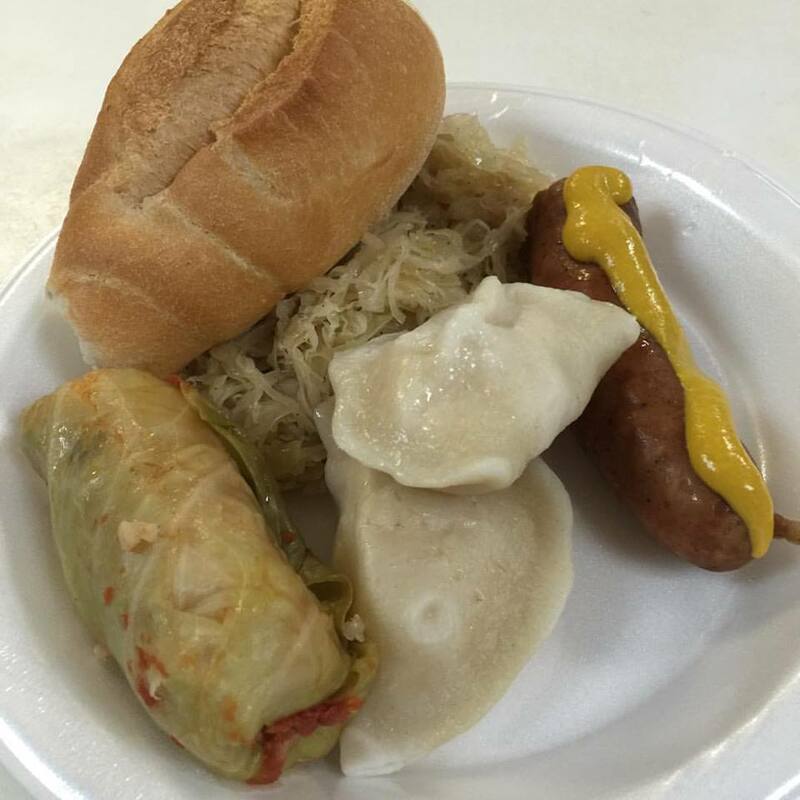 Perogies, cabbage rolls, shish-kabobs….all of your Fiesta Week favs, cooked FRESH to order. Call your order in to my Chocha Sonnia before you come. Your best bet is to leave a message with your order on Monday at some point or call them when they get started on Tuesday morning at around 8am. They’ll do large orders, too, if you’re hosting Christmas Eve dinner and you don’t feel like cooking, dial 905.728.1321 and tell her ‘Shwa Girl sent you! You’ll need to pick up your orders by 2pm. Prices and menu items vary from the Fiesta Week menu below, so please inquire when you call. I DO know that they charge $9 for a dozen perogies, and you can get them either fresh or frozen. $10 for a dozen cabbage rolls. But Lviv Hall isn’t the only Cultural Centre that sells perogies and cabbage rolls throughout the year. In fact, General Sikorski Hall offers the Eastern European Food Connoisseur a slightly different dining experience. I’ve been aware that you can eat-in at General Sikorski’s Red Room Restaurant for a while now, but I’ve never had the pleasure of eating at the restaurant itself. I’ve attended many, many functions in the main hall, though. Most recent being a charity event where my girlfriends and I left our kids and husbands at home and went out for a night of wine drinking, dinner and dancing. The food (prepared by the polish ladies in the kitchen of Sikorski), was excellent. What was NOT excellent was the decision to go out for more cocktails after the charity event. Oy. I’d review the restaurant that we went to afterwards for drinks, but I don’t think I’m allowed back there again. But as per usual, I digress. The Red Room Restaurant at General Sikorski Hall is only open on Sundays from 1pm to 7pm. I had a few hours to kill while my husband and son did boy things (Home Depot), this past Sunday afternoon, so I decided to check it out. I absolutely love the grounds that General Sikorski Hall sits on. It’s just far enough away from the city to actually feel like you’re on your way to somewhere special. The property is lush and vast. Before writing this entry, I did a bit of research on the property from an old book I found while going through my mom’s things that was published for the 20th Anniversary of The Oshawa Folk Arts Council. 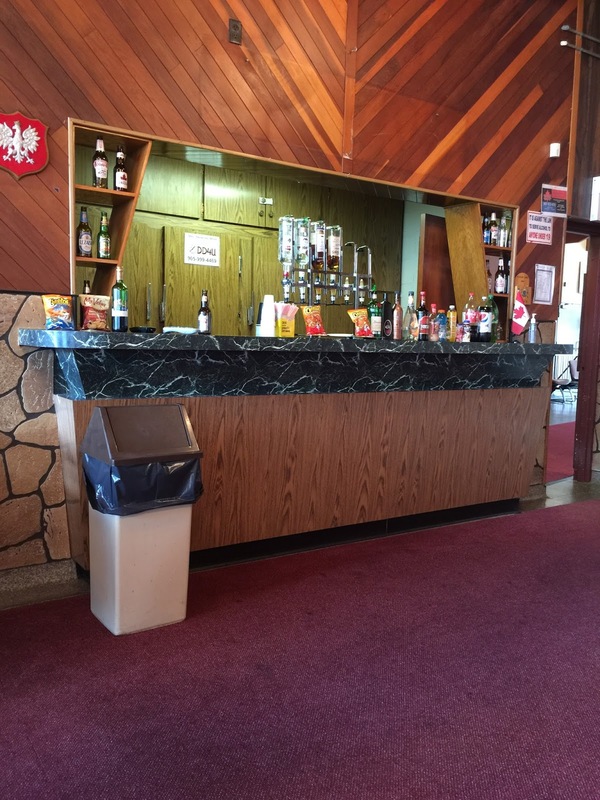 Apparently, The General W. Sikorski Polish Veterans’ Association in Oshawa started with three men in 1933 and grew throughout the depression, when they felt the need to stick together during hardships. It’s quite a community centre. Loads and loads of parking, lots of green-space and soccer fields. The building itself is a throwback to the time when it was built, with it’s modernist style and groovy foyer. Wood panelling EVERYWHERE. 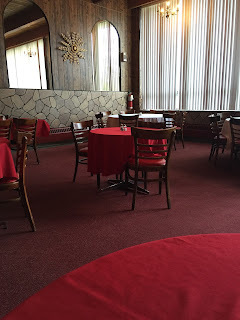 At the very back corner of the front foyer is a sign that says, “Red Room Restaurant”. The first thing I noticed about the room was how unbelievably CLEAN it was. It was spotless. Although I felt like I was walking into the dining room of a Catskills Resort in 1961, there was absolutely no sign of any wear and tear. These people really, really take great care of their building. It was lovely and I found myself wishing it really WAS 1961 and I was on vacation in upstate NY with my family and I was secretly practicing a tango with the darkly handsome but troubled dance instructor because the female dance instructor had got herself into some trouble with a rich boy from the city and……Obviously, Dirty Dancing was my favourite movie growing up. Gimme a break. It was 1991….. Anyway, the dining room was set up with about twelve round tables with red linens. It was empty except for a table of ladies and gents who reminded me of the ladies and gents who would sit around a table at Lviv. I got there in between lunch time and dinner time, so they were obviously taking a breather. One of the ladies immediately got up and greeted me. She mentioned that I could eat in, or take out. I told her I’d be staying. I chose a table near the pristine, vintage-looking bar (the restaurant is licensed), and checked out the menu. It was exactly as I hoped it would be – a variety of Eastern European favourites – Perogies, Cabbage Rolls, Shish-Kabobs, Sourkraut and Sausage. Perfect. I ordered the half-plate, which gave me a taste of everything. It had me at the mention of gravy. I could almost guarantee that the gravy they were offering was homemade and I consider myself an expert on the subject of gravy. IN FACT, my mother used to make homemade mushroom gravy once in a while and I would drink it straight from a cup because it was so good. I like light gravy, heavy gravy, salty gravy, spicy gravy, gravy is what makes the world go ‘round, my friends. If you asked me what was more fulfilling – giving birth to my first and only son or eating my grandfather’s German peppercorn gravy on Sunday afternoons growing up, it would be a close tie. As I was waiting for my food, a middle-aged couple came in and sat down. They ordered a bottle of wine from the bar and were deep in conversation. Then a mother with her young daughter came in for take-out. By the time my food arrived, there were about four tables filled with happy diners. My father, who spoke fluent Ukrainian but taught himself Polish so he would be able to speak to his Polish clients, taught me how to say “thank you,” in Polish. As the lady placed my food in front of me, I proudly stated, “Dziękuję”. She said something back to me in Polish, and turned and walked away. I’m assuming it was “you’re welcome”, but it could have been anything. My dad didn’t get very far with teaching me Polish. My Ukrainian is choppy enough. My dish was an attractive plate of two pieces of chicken, mashed potatoes, a cabbage roll, a perogie and an assortment of vegetables. AND GRAVY. The perfectly coloured gravy was poured over the mashed potatoes and parts of the cabbage roll. I couldn’t help but dig into the potatoes and grave right away (yes, you read “grave,” because when you love gravy as much as I do, you give it an endearing nickname of affection). First taste: Delicious. The potatoes were creamy and mashed and had a hint of cheddar cheese, spiced to perfection. The gravy was mildly peppered and tangy. The perogie was fresh and plump. To my chagrin, it was missing the usual bits of sautéed onion that I’m used to eating at Sikorski during Fiesta, which made the perogie very similar to the fried-onion-less perogies at Lviv. The chicken was juicy and perfectly fried. The coating on the chicken skin contained some kind of BBQ sauce which was a nice change from regular fried chicken, and I was impressed with the amount of meat inside the cabbage roll. I’d say the meat to rice ratio was about 7 to 3. I’m not sure if that actually constitutes a ratio because I dropped math after grade 11. Regardless, those cabbage rolls had lots of meat in them. The vegetables were the standard mix of green and yellow beans with baby carrots. They were fine, but when you have all those carbs on your plate, who wants a veg??? Not me! On the whole, my meal was absolutely delicious. It would appeal to the Eastern European and the non-Eastern-European citizen of Durham Region alike. The Red Room Restaurant would be perfect for families who enjoy going out for a nice meal on Sunday afternoon, or a couple who is looking for something different to do for a date. Or a perogy lover who wants to eat a beautifully cooked perogy in an interestingly lovely dining room. After my meal, I subconsciously picked up my plate like a good Ukrainian girl and took it to the ladies in the kitchen, self-consciously mumbling “Dziękuję” under my breath and told them how great I thought the meal was. They seemed pleased and I made my way back to the table. I had ordered a couple of dozen perogies and some cabbage rolls to take-out for my friend Tobi, who is a non-Ukrainian, non-Polish perogy lover. The server brought me my take-out order along with my bill. It was fairly priced, too. On my way out the door, I stopped to chat to the gentleman behind the bar. I told him I really enjoyed the meal and he told me to come back again soon. We got to talking about the construction of the hall itself and how attractive the room was. As we talked, we walked across the front foyer to the entrance of the main hall and peeked our head in. I gushed about the architecture in that room. I love the exposed ceiling beams and all the wood accents around the large hall. I went to TWO proms in that room – grade 11 and grade 12. Our grade 13 prom (of which I was the PROM QUEEN. 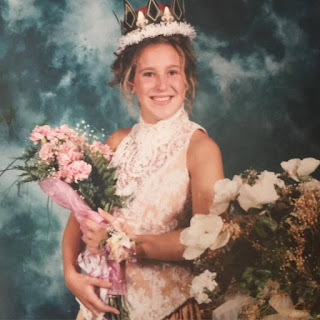 Yes, that’s right, the PROM QUEEN. 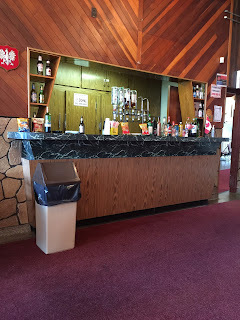 I try to throw that into as many conversations as I can), was held at The Oshawa Golf Club, but it didn’t have the same friendly, cosy vibe as the other two at Sikorski. We finished up our conversation by introducing ourselves. His name was Stan and he had come to Oshawa in 1971. I told him my name and he asked if I was the same Laskowsky as the Lawyer downtown Oshawa. I mentioned that yes, Tony Laskowsky was my Dad, and Stan immediately hugged me. He said that he was so sorry to hear about my family and that my dad had been his lawyer for many, many years. He said how nice it was that my Dad could speak Polish when he (Stan) first came to town and how much he liked and admired my Dad. I hugged him back and wiped away my tears. I had been having a pretty rough day missing my parents and this interaction with Stan was such a lovely thing to have happened. I thanked him again for the kind words and delicious food and headed out to my car. We are surrounded by so many kind, compassionate people in Oshawa. We are also surrounded by some incredible multi-cultural foods and customs. It seems as though my quest for the best food in the ‘Shwa is also turning into a journey about learning about the people and the City that raised me. And on that dramatic note, as I was walking out to my car, I tripped over my flip-flop and fell on my knee. Like, how old am I?!?? Jesus. I’m full of poise. Lviv Hall is located at 38 Lviv Blvd., Oshawa, 905-728-1321, and the Red Room at General Sikorski Hall is located at 1551 Stevenson Road, Oshawa.